Research is a central component of all Chemistry Department programs, providing opportunities for students to apply knowledge and skills from the classroom to significant questions and problems in the laboratory. Research areas span analytical/environmental chemistry, inorganic and biomaterials, medicinal chemistry, biochemistry, computational chemistry, chemical education, and organic synthesis. The summer months are a vital time for students to acquire skills, develop work habits, improve professional and academic connections, and to strengthen their resumes. At Bethel, chemistry and biochemistry majors regularly participate in focused research during the summer—particularly after their sophomore or junior years of study. 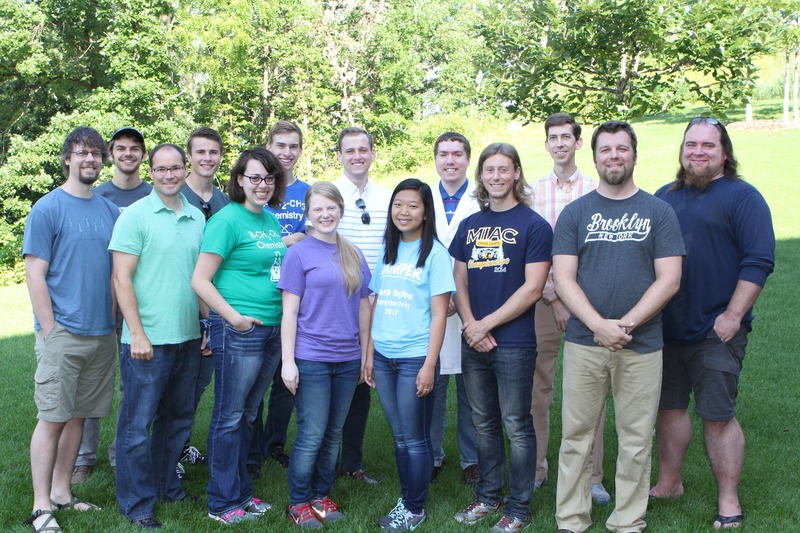 The annual Chemistry Department Summer Research Fellowship program at Bethel partners students and professors on intensive research projects. Summer research stipends for this endeavor are funded by a combination of endowments, gifts, grants, and internal support. Learn more about Bethel’s support for research on the Office of Undergraduate Research and Scholarship website. Other students take advantage of the opportunity to experience a large-university research environment by participating in REU programs across the country. Some students are offered summer internships in industry (both large and small companies) or at universities obtained through the professional and scientific network of collaborators of Bethel professors. Following several years of building up the size of the summer research program, the summer of 2015 has been the busiest yet around the department, with 6 professors and 10 students involved. Funding for the research was provided by the Science Initiative Chemistry Endowment, donations to the Chemistry Gift fund, as well as by Medtronic, Inc.
"Symmetrically Substituted Building Blocks for the Preparation of Hybrid Organic-Polyoxometalate-Based Frameworks"
"Interactions of Glutaraldehyde with Oxidizing Agents and Tissue"
"Synthesis and Analysis of Inorganic Ion-Exchange Materials"
"HPLC Analysis of ProClin-Buffer Solutions"